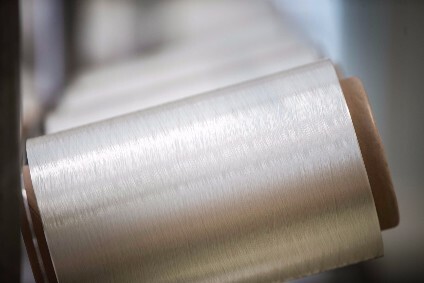 Austrian cellulosic fibre producer Lenzing has developed a new lyocell filament it says heralds a new era of sustainable cellulose fabrics for the luxury apparel market as it gives a similar drape and texture to silk. Tencel Luxe, which marks Lenzing's entrance into the filament market, is another "key milestone" in the implementation of the company's sCore TEN strategy, which focuses on profitable growth based on environmentally-friendly speciality fibres. Unveiled at an exclusive event in Paris, the filament is described by Lenzing as "the new player" for sustainable high-end cellulose textiles, offering superior aesthetics, performance and comfort level that allow them to be the perfect partner with other "noble" fibres such as silk, cashmere or wool. Made from wood pulp, which is sourced from sustainable wood in line with Lenzing's strict Wood and Pulp Policy, Tencel Luxe filaments are produced using Lenzing's closed-loop lyocell production process, which ensures minimal environmental impact due to low process water and energy use and raw materials consumption. "We are committed to setting industry standards in order to enhance the protection of our environment while making filaments for fabrics that are designed to appeal to the most sophisticated consumers," explains Lenzing CEO Stefan Doboczky. "The launch of Tencel Luxe is a further sign of our ongoing commitment towards innovation and sustainability. "With the help of Tencel Luxe, Lenzing will support the luxury apparel industry to redraw the borders between responsibility and high-end luxury fashion, and is part of Lenzing's ongoing commitment towards sustainability-driven innovation," he adds. Tencel Luxe will be produced at Lenzing's Austria site, with plans to expand the site capacity over the coming years. Lenzing says it has already started the basic engineering for a large scale commercial line for filaments. "The decision for the Lenzing site in Austria as a hub for Tencel Luxe helps to build up a strong knowledge base for this new technology at the headquarters of the company," adds chief technology officer Heiko Arnold. "Here we can fully leverage the proximity between operations, research and development, customer service and the engineering organisation to accelerate the development of this technology for the production of Tencel Luxe on a bigger industrial scale." Arnold says a decision about a new plant for the production of Tencel Luxe on a bigger industrial scale will be made in the third quarter of 2018. Last month, Lenzing opened a "state-of-the-art" fibre and fabric testing centre in Hong Kong, which it says will bring it closer to its partners along the value chain in Asia.